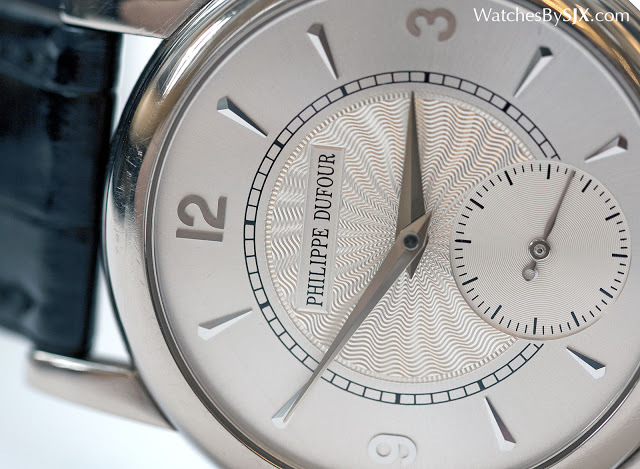 Philippe Dufour introduced the Simplicity in the year 2000, but it had been in the works for several years before that. This very watch is the first ever Simplicity, the prototype of a series that would eventually number just over 200 produced. Now worn almost daily for 15 years, Simplicity No. 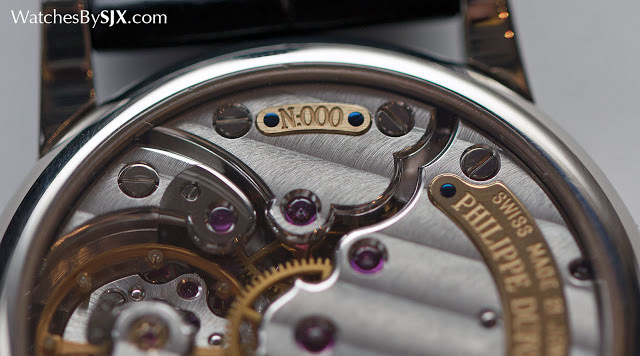 000 has the charm of a well worn but precious timepiece. Dufour unveiled the Simplicity at Baselworld 2000, some eight years after his landmark grande and petite sonnerie wristwatch, in a 34mm case. 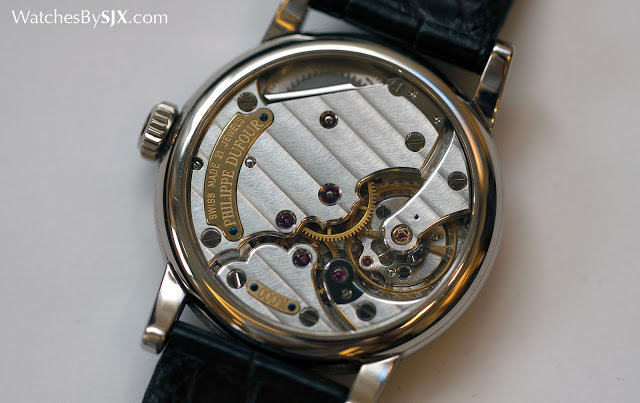 A year after its introduction Dufour created a larger, 37mm Simplicity that was essentially an upsized version, complete with a slightly larger movement. Inspired by mid-20th century watchmaking of the Dufour’s native Vallee de Joux, the original 34mm Simplicity is a small watch by today’s standards, though the long lugs make it seem a little larger. Nonetheless it is exactly what Dufour wanted it to be, a tribute to the classical watchmaking of Vallee de Joux before the quartz crisis of the 1970s that decimated the Swiss industry. So what was changed? The prototype is largely similar to the production version of the Simplicity, with a few minor changes. Those include the lettering at the bottom of the dial, which includes the name of the dial maker, Metalem, on the serial production pieces. The prototype merely reads “Swiss”. 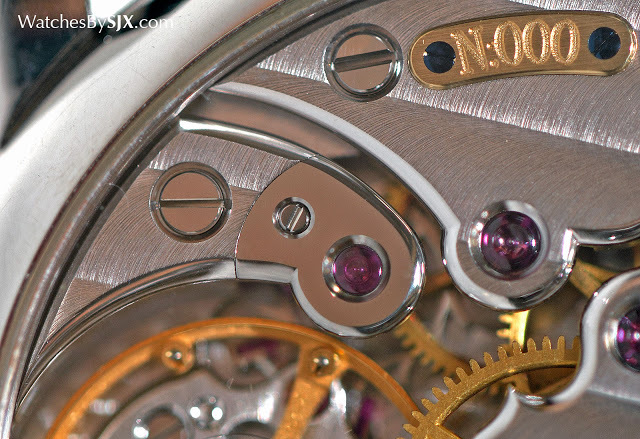 On the reverse, the improvements made to the movement are more subtle. The jewel for the centre wheel that drives the hour hand is distinctly larger in the production model. 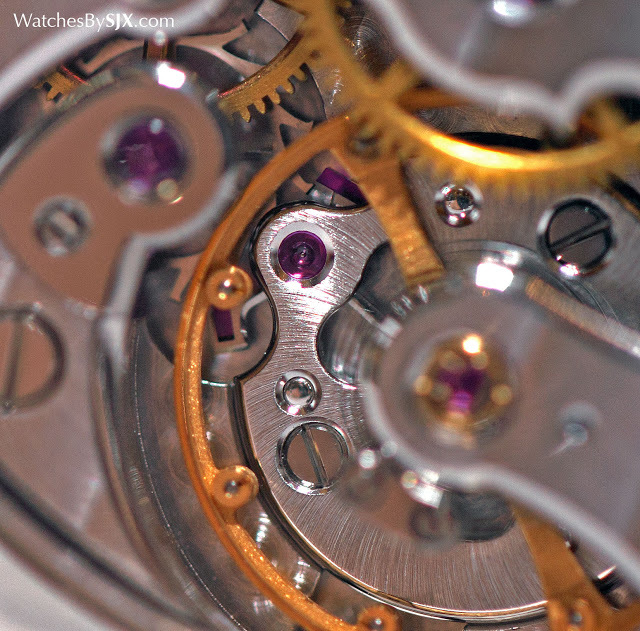 Dufour explained in a recent conversation that large jewels, bigger than those on the average movement, are a personal favourite because they resemble the jewels on vintage high-end pocket watch movements. Another readily discernible change is the lettering on the two solid gold plates for the brand and serial number. The prototype has laser engraved text while the production pieces are all hand-engraved. Less obvious is the different balance wheel. 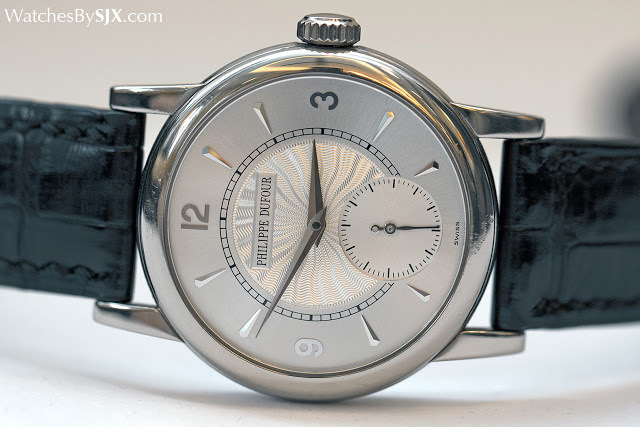 The prototype has a balance with a smooth rim and adjustable weights, one that looks very much like the Patek Philippe Gyromax balance. Production models uses a screwed balance that looks more like those used in the movements that inspired the Simplicity. 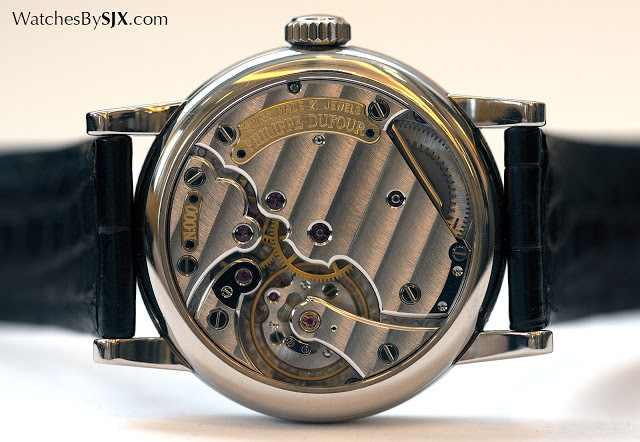 The other changes from prototype to production reveal the Dufour’s attention to detail, and his commitment to no-effort spared movement decoration. Like on the bridge for the third and fourth wheel (it carries the plate with the serial number): on the production version it has a cutout on its outer edge to reveal a base plate screw, while on the prototype the edge is smooth. The cutout requires extra finishing to polish the bevelled edge and corners of the cutout. And the last difference is even less conspicuous. The screw for the black polished escape wheel cap (it’s vaguely kidney-shaped, beside the balance wheel) sits in a countersink, basically a hole with sloped, conical edges. The same part on the production model lacks a countersink, which is an aesthetic improvement, since that leaves the black polished surface of the cap unbroken as the screw head is black polished as well. 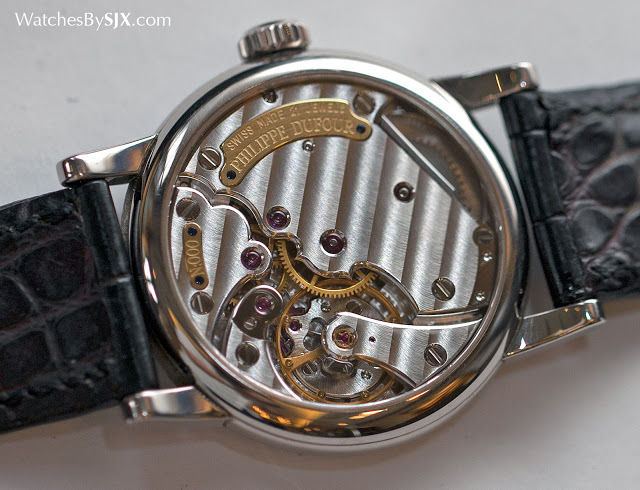 Despite the subsequent changes, the movement in the prototype is immensely gorgeous. It will one day be a historically important wristwatch. 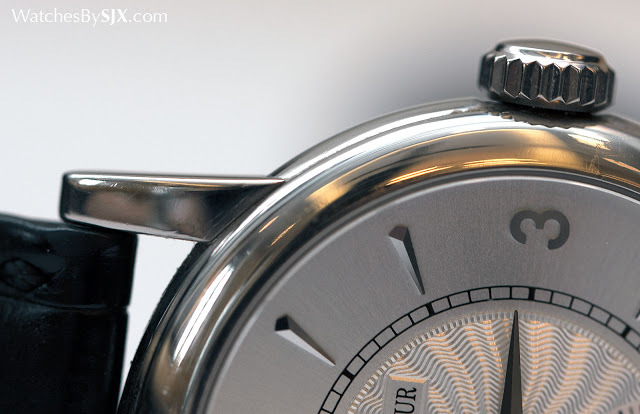 Now that you have seen the first ever Dufour Simplicity, remember to read our story covering the last four Simplicity wristwatches – four more than the originally promised 200-piece production run – that were delivered in late 2014.